Emphysema is one of the major pathological abnormalities associated with chronic obstructive pulmonary disease. The protease/antiprotease imbalance and inflammation resulting from oxidative stress have been attributed to the pathogenesis of emphysema. Nrf2 is believed to protect against oxidative tissue damage through the transcriptional activation of a battery of antioxidant enzymes. In this study, we investigated the protective role of Nrf2 in the development of emphysema using elastase-induced emphysema as our model system. We found that elastase-provoked emphysema was markedly exacerbated in Nrf2-knockout (KO) mice compared with wild-type mice. The severity of emphysema in Nrf2-KO mice correlated intimately with the degree of lung inflammation in the initial stage of elastase treatment. The highly inducible expression of antioxidant and antiprotease genes observed in wild-type alveolar macrophages was significantly attenuated in the lungs of Nrf2-KO mice. Interestingly, transplantation of wild-type bone marrow cells into Nrf2-KO mice retarded the development of initial lung inflammation and subsequent emphysema, and this improvement correlated well with the appearance of macrophages expressing Nrf2-regulated antiprotease and antioxidant genes. Thus, Nrf2 appears to exert its protective effects through the transcriptional activation of antiprotease and antioxidant genes in alveolar macrophages. Chronic obstructive pulmonary disease, including pulmonary emphysema, chronic airway obstruction, and chronic bronchitis, is a major public health problem predicted to emerge as one of the top five causes of death and disability worldwide by the year 2020 (1). Emphysema is pathologically characterized as a breakdown in alveolar architecture, with enlargement of alveolar airspaces due to the destruction of alveolar walls. Lung parenchymal inflammation, protease/antiprotease imbalance, and oxidative stress are thought to be important processes in the development of emphysema (2, 3, 4). These processes may interact or synergize with each other in provoking the characteristic pathological changes associated with emphysema. Cigarette smoking is a major cause of emphysema. Importantly, however, not all smokers develop clinically significant emphysema, and this observation suggests that some additional factors may be involved in determining individual susceptibility to emphysema (5). A well-documented host factor is a hereditary deficiency of α1-antitrypsin, a major circulating inhibitor of serine protease that is synthesized in the liver (6, 7). This hereditary disease shows premature and accelerated development of panlobular emphysema in both smokers and nonsmokers. However, other candidate host factors influencing the risk of emphysema require identification because the majority of patients with emphysema have normal serum levels of α1-antitrypsin. Nrf2 (NF-E2-related factor 2), a member of the cap’n’collar family of basic leucine zipper type transcription factors, has been shown to bind to the antioxidant response element (ARE)3 as an obligatory heterodimer with small Maf protein in the induction of phase 2 enzymes and antioxidant genes (8, 9). Nrf2 binds to the Kelch-like ECH-associated protein (Keap1), a cytosolic actin-binding protein, which retains it in the cytoplasm under normal physiological conditions. When cells encounter oxidative or xenobiotic stress, Nrf2 is released from Keap1, allowing its rapid translocation to the nucleus (10, 11, 12, 13). Nrf2-knockout (Nrf2-KO) mice grow normally and are fertile, but are susceptible to oxidative stress and reactive electrophiles (14, 15, 16, 17, 18). Nrf2 plays essential roles in protection against pulmonary inflammation caused by environmental toxins such as butylated hydroxytoluene (19) and hyperoxia (20). Moreover, it is reported that Nrf2 regulates inflammation in carrageenan-induced pleurisy and acute lung injury (21, 22). To understand the pathogenesis of emphysema, rodent models of elastase-inducible emphysema have been established (23, 24). Intratracheal instillation of porcine pancreatic elastase (PPE) first induces lung inflammation and subsequently results in alveolar wall destruction. These pathological changes closely mimic those in human emphysema. In the present study, we therefore investigated the susceptibility of Nrf2-KO mice to PPE-induced emphysema to explore the role of Nrf2 in protection against emphysema. Wild-type BALB/c mice were purchased from Charles River Breeding Laboratories. Nrf2-KO mice with a BALB/c background were established by specific deletion of the Nrf2 gene segment (8). All mice used in this study were 6- to 8-wk-old and maintained in our animal facilities under specific pathogen-free conditions. All animal studies were approved by the Institutional Review Board. The mice were anesthetized with fluothane (Takeda Pharmaceuticals) and given an intratracheal instillation of 25 μg of PPE (Elastin Products) in 0.1 ml of sterile saline solution or 0.1 ml of saline alone. On days 1, 4, and 21 after PPE administration, mice were anesthetized by i.p. injection of pentobarbital (50 mg/kg body weight). The trachea and lung were removed together and inflated with 4% paraformaldehyde in PBS to a water pressure of 25 cm. The tissue was then embedded in paraffin and 2-μm thick sections were stained with H&E. Air space enlargement was quantified by the mean linear intercept (Lm) in 20 randomly selected fields of tissue sections (25). On days 1 and 4 after PPE administration, the lungs of terminally anesthetized mice were lavaged with six sequential 1-ml aliquots of PBS. The supernatant of the first BAL was used for analysis of albumin concentration (Sigma-Aldrich). The supernatant was also used for analysis of neutrophil elastase by spectrophotometrical measurement as previously described (26). Hemoglobin content in a pooled aliquot was represented as the absorbance at 412 nm. The remaining pool of BAL was centrifuged and resuspended in PBS. Cells were counted using a hemocytometer and a differential cell count was performed by standard light microscopic techniques based on staining with Diff-Quik (American Scientific Products). Twenty-one days after PPE administration, terminally anesthetized mice were tracheostomized, and the trachea was cannulated. After opening the chest wall, the cannula was connected to a computer-controlled small animal ventilator (flexiVent; Scireq). The compliance was determined by recording the relaxation pressures during inflation and deflation in 0.1-ml steps between 0 and 25 cm H2O. Due to variation in the weight of each animal, the lung volumes were normalized by body weight. Pressures from the normalized compliance curves were then extrapolated at 0.1-ml increments and used to establish the mean static lung compliance in each group. Total RNA was extracted from the lungs of anesthetized mice using an RNeasy Mini kit (Qiagen). Electrophoresis of RNA was conducted on formaldehyde-agarose gels and RNA was transferred to nylon membranes (Hybond-N+; Amersham Biosciences). Hybridization was performed using hybridization solution (ExpressHyb; BD Clontech) containing 1 × 106 cpm/ml [α-32P]-labeled mouse NAD(P)H:quinine oxidoreductase (NQO1), GST-Yc, heme oxygenase-1 (HO-1), peroxyredoxin I (PrxI), or GAPDH cDNA fragments following the manufacturer’s protocol. After washing, autoradiograms were made using a bioimaging analyzer (BAS5000; Fuji Photo Film). Neutrophils were isolated from blood and BAL by standard Percoll discontinuous gradient centrifugation (Pharmacia Biotech). Total RNA was extracted and the expression of neutrophil elastase was analyzed by RT-PCR using the primer set 5′-CAT TGC CAG GAA CTT CGT CA-3′ and 5′-GAG TGC ATA CGT TCA CAC GA-3′. Total RNA was also extracted from the lungs and livers of anesthetized mice. The expressions of α1-antitrypsin and secretory leukoprotease inhibitor (SLPI) were analyzed by RT-PCR using the following primers: α1-antitrypsin, 5′-CAA CCT CAC ACA AAC ATC GG-3′ and 5′-AAC TGT GTC TTC GTC AGG GT; and SLPI, 5′-TGC CAC CTA CTT CTG TAG-3′ and 5′-CCA CAC TGG TTT GCG AAT-3′. The serum level of α1-antitrypsin was determined by enzymatic assay as previously described (27). Alveolar macrophages obtained from BAL were untreated or treated with diethylmaleate for 3 h. For the detection of Nrf2 and HO-1, 20 or 2 μg, respectively, of the total cell extracts were separated by SDS-PAGE in the presence of 2-ME and electrotransferred onto Immobilon membrane (Millipore). The membrane was subsequently probed by monoclonal anti-Nrf2 Ab. For making mAb against mouse Nrf2, rats were immunized by GST-Nrf2 fusion protein encoding aa 140–318 of mouse Nrf2. As a loading control, the membrane was also probed with anti-lamin B Ab. To detect immunoreactive proteins, we used HRP-conjugated anti-rabbit IgG and ECL blotting reagents (Amersham). The 1.25 kb of the mouse SLPI 5′ regulatory region was amplified by PCR using mouse genomic DNA as template and the primers 5′-TGA GCA GCA CTA ACC TGA CT-3′ and 5′-AAG GGG AGC TCT GAT GAC CA-3′, then cloned into pGL3-basic vector (SLPI-luc). Deletion of the SLPI 5′ regulatory region was done by removing the SpeI fragment from SLPI-luc (ΔSpeI-luc). The murine macrophage cell line RAW 264.7 (American Type Culture Collection) was grown in DMEM (Invitrogen Life Technologies) containing 10% FBS and seeded in 6-well dishes 24 h before transfection. Cells were transfected with reporter and Nrf2 expression plasmids (9) using Lipofectamine Plus reagent (Invitrogen Life Technologies) according to the manufacturer’s instructions. The luciferase assay was performed with the Dual-Luciferase Reporter Assay kit (Promega) following the supplier’s protocol and measured by a Biolumat Luminometer (Berthold). Transfection efficiencies were routinely normalized to the activity of a cotransfected Renilla luciferase. The means of four independent experiments are shown with SE. Paraffin sections (4-μm thick) were cut and mounted on poly-l-lysine-coated glass slides. After removing the paraffin, endogenous peroxidases were quenched with 0.3% H2O2 in methanol. After washing, sections were incubated with anti-F4/80 Ab (Serotec), anti-HO-1 Ab (16), anti-PrxI Ab (17), or anti-SLPI (Santa Cruz Biotechnology) Ab and incubated for another hour with Histofine Simple Stain MAX-PO (Nichirei). Diaminobenzidine was used as a chromogen. Femurs and tibiae were obtained from 6- to 8-wk-old wild-type or Nrf2-KO mice. Bone marrow cells were harvested in RPMI 1640 medium and resuspended in sterile PBS. Nrf2-KO recipient mice were irradiated at a dose of 3.0 Gy, followed by caudal vein injection of 20 × 106 cells. At the specified time points, the lungs of the recipient mice were lavaged and cells positive for F4/80 were sorted using FACSVantage (BD Biosciences). DNA was extracted from the sorted cells and Nrf2 gene expression was determined by PCR using the primers 5′-TGG ACG GGA CTA TTG AAG GCTG-3′ and 5′-GCC GCC TTT TCA GTA GAT GGA GG-3′. To determine the efficiency of donor cell influx to the recipient’s alveolar space, genome DNA was extracted from alveolar macrophages and the contribution of male cells to alveolar macrophages of female recipients was examined by real-time PCR as previously described (28). The male genomic DNA level was assessed through determining the SRY gene content in the sample by PCR. The results were normalized by β-actin gene content. Primer sequences are as follows; SRY, 5′-GGG TGC TTA TGT CTC TTT CTC TGG-3′ and 5′-GGT CCT TGT CCT GTA TCT ATG GCT C-3′; and β-actin, 5′-CCA TAG GCT TCA CAC CTT CCT G-3′ and 5′-GCA CTA ACA CTA CCT TCC TCA ACC G-3′. Known mixtures of male and female DNA were used to establish standard curves. Individual samples were normalized to the 100% male reference standard according to the following formula: 1.9 exp(CT SRY100%−CT SRY)/1.9 exp(CT β-actin100%−CT β-actin), where the threshold cycle CT represents the crossing point for the samples of SRY or β-actin. The level of male DNA (SRY) was estimated by linear regression using all control mixture standards. Data were evaluated by ANOVA and Scheffe’s test. Values for p < 0.05 were considered to be statistically significant. To elucidate the role of Nrf2 in protection against emphysema, we first evaluated the development of emphysema 21 days following PPE treatment. No pathological differences were observed between wild-type and Nrf2-KO mice before PPE treatment upon microscopic examination (Fig. 1⇓, A and B). After PPE treatment, enlargement of airspaces and alveolar wall destruction were observed in both wild-type (Fig. 1⇓C) and Nrf2-KO mice (Fig. 1⇓D). However, these pathological changes were much more severe in Nrf2-KO mice than in wild-type mice. As can be seen in Fig. 1⇓D, the alveolar walls are more severely damaged in the lungs of Nrf2-KO mice treated with PPE compared with wild-type mice. To further characterize the development of emphysema in Nrf2-KO animals, we determined the airspace enlargement by measuring the mean linear intercept in 20 randomly selected fields from H&E stained tissue sections. The mean linear intercept values in Nrf2-KO mice were approximately three times higher than values found in wild-type mice after PPE treatment (Table I⇓). A pulmonary function test revealed that static lung compliance was significantly increased in PPE-treated Nrf2-KO mice compared with compliance in saline-treated Nrf2-KO animals 21 days after treatment, showing very good agreement with histological observations (Fig. 1⇓E). This increase in static lung compliance was not observed in wild-type mice following PPE treatment (Fig. 1⇓E). 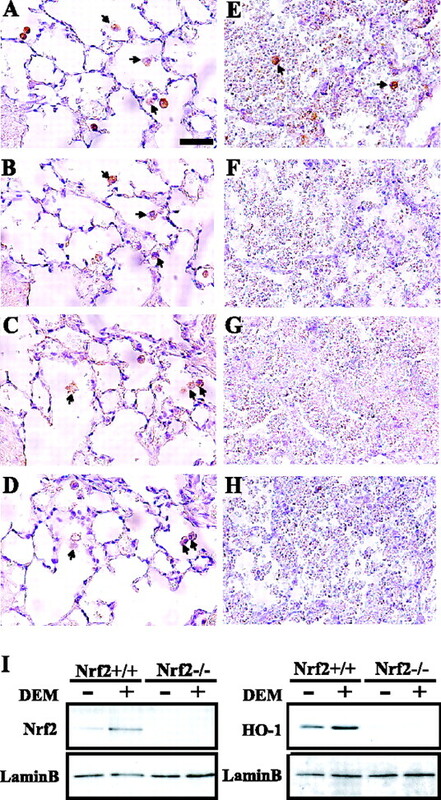 Taken together, these histological and physiological evaluations demonstrate that Nrf2-KO animals are more susceptible to PPE-induced emphysema. 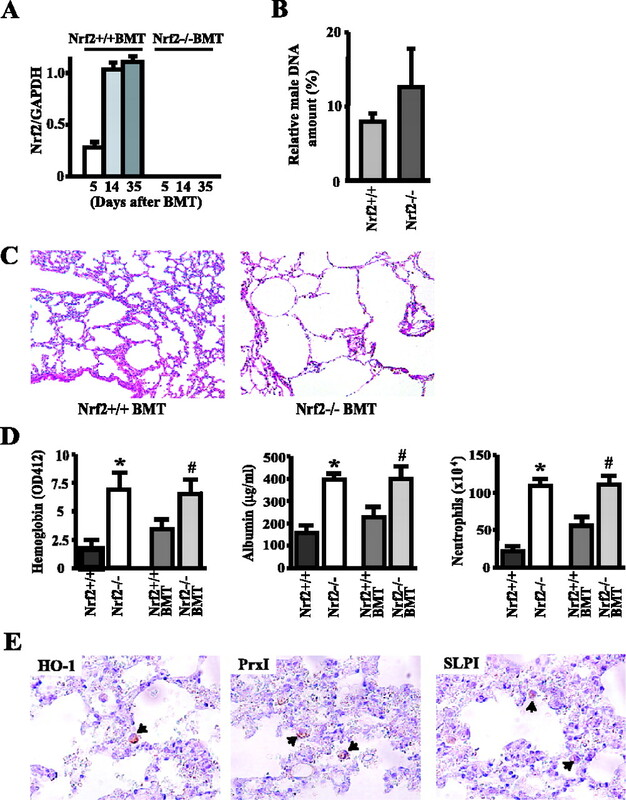 PPE-induced emphysema was exacerbated in Nrf2-KO mice. H&E staining of lung tissue sections from wild-type mice (A) 21 days after treatment with saline, Nrf2-KO mice (B) 21 days after treatment with saline, wild-type mice (C) 21 days after treatment with PPE, and Nrf2-KO mice (D) 21 days after treatment with PPE. Bar = 100 μm. E, Static lung compliance of wild-type mice (Nrf2+/+) or Nrf2-KO mice (Nrf2−/−) 21 days after treatment with PPE or saline. Data are expressed as the mean ± SEM of four mice from each group. Significantly different from the other groups (∗, p < 0.01). To delineate the contribution of preceding lung inflammation to the development of emphysema, the severity of the initial hemorrhagic inflammation was compared between wild-type and Nrf2-KO mice 1 and 4 days after PPE treatment. In wild-type mice, hemorrhagic lung inflammation characterized by alveolar hemorrhage, alveolar edema, and the infiltration of neutrophils into airspaces was observed 1 day after PPE treatment (Fig. 2⇓A). However, the hemorrhagic inflammation had resolved by day 4 following PPE treatment and emphysema had not developed by that time (Fig. 2⇓B). In contrast, the pathological changes were much more severe in Nrf2-KO mice (Fig. 2⇓C) than in wild-type mice by day 1 (Fig. 2⇓A) and hemorrhagic lung inflammation persisted by day 4 (Fig. 2⇓D). It should be noted that enlargement of the airspaces had already been observed in the lungs of Nrf2-KO mice by day 4 (Fig. 2⇓D). Inflammation was exacerbated in Nrf2-KO lung in the initial stage of PPE-induced emphysema. H&E staining of lung tissue sections from wild-type (A and B) and Nrf2-KO (C and D) mice 1 day (A and C) and 4 days (B and D) after treatment with PPE. Bar = 100 μm. To quantify the enhancement of initial lung inflammation in Nrf2-KO mice, we analyzed several inflammatory parameters using BAL fluid. By day 1, the hemoglobin concentration in BAL fluid was significantly higher in Nrf2-KO mice than in wild-type mice (Fig. 3⇓A). Although the hemoglobin concentration had decreased to control values in wild-type mice by day 4, the level of hemoglobin was still high in Nrf2-KO mice. Similarly, the albumin concentration, an indicator of lung vascular permeability, in BAL fluid was significantly higher in Nrf2-KO mice than in wild-type mice both 1 and 4 days after PPE treatment (Fig. 3⇓B). Quantitative analysis of lung inflammation in the initial stage of PPE-induced emphysema. Hemoglobin content (A), albumin concentration (B), number of neutrophils (C), number of macrophages (D), and neutrophil elastase activity (E) in BAL fluids from wild-type mice (Nrf2+/+) or Nrf2-KO mice (Nrf2−/−) before (Before) and 1, 4, 8, and 21 days after treatment with PPE. Data are expressed as the mean ± SEM of eight mice from each group. Significantly different in comparison with corresponding wild-type mice (∗, p < 0.05). F, Expression of neutrophil elastase in the neutrophils obtained from blood and BAL fluids 1 day after treatment with PPE. RT-PCR analyses (top panels) and quantification of the bands by densitometric analysis (bottom panels) are represented. Significantly different from blood neutrophils (‡, p < 0.05). The number of neutrophils present in BAL fluid was also significantly greater in Nrf2-KO mice than in wild-type mice 1 day after PPE treatment (Fig. 3⇑C). By day 4, the number of neutrophils remained high in Nrf2-KO mice, but recovered to a basal value in wild-type mice (Fig. 3⇑C). Alveolar macrophages were induced by PPE treatment in both wild-type and Nrf2-KO mice (Fig. 3⇑D). However, the induction was transient in wild-type mice and peaked at day 1, yet the induction persisted in Nrf2-KO mice. The neutrophil elastase activity in BAL fluid was significantly elevated in Nrf2-KO mice compared with that in wild-type mice both 1 and 4 days after PPE treatment (Fig. 3⇑E). These results demonstrate that Nrf2-KO animals develop severe pulmonary inflammation and exhibit a higher protease activity in the airspaces in the early period following PPE treatment. Consequently, emphysema was apparent by day 4 in Nrf2-KO animals. Neutrophil elastase activity in BAL fluids reflects the balance in elastase and anti-elastase activity in the airspaces. To clarify whether a high protease activity in Nrf2-KO mice is due to the enhanced expression of neutrophil elastase, its expression was evaluated in neutrophils obtained from blood or BAL fluids 1 day after PPE treatment in both wild-type and Nrf2-KO mice. In both genotypes of mice, only a few mRNA transcripts were expressed in blood neutrophils. Although neutrophils infiltrated into the airspaces by stimulation with PPE exhibited significantly higher expression of neutrophil elastase, expression was not different between wild-type and Nrf2-KO mice (Fig. 3⇑F). Thus, a high protease activity in Nrf2-KO mice may not be due to increased elastase balance but due to decreased anti-elastase balance. To clarify whether a high protease activity in Nrf2-KO mice is due to the inactivation of antiprotease, we examined the expression of two antiprotease genes, α1-antitrypsin and SLPI. The constitutive expression level of α1-antitrypsin observed in both lung and liver was unaltered by PPE treatment and equivalent to that in Nrf2-KO mice (Fig. 4⇓A). The activity of serum α1-antitrypsin was consistent with this result (Fig. 4⇓B). Interestingly, the SLPI gene was significantly induced in the lungs of wild-type mice 1 and 4 days after PPE treatment (Fig. 4⇓C). In Nrf2-KO mice, however, SLPI mRNA was not induced by the stimulation of PPE (Fig. 4⇓C). The expression of SLPI in the liver was unaltered by PPE treatment in both genotypes of mice (Fig. 4⇓C). A database search revealed that several ARE consensus-like sequences exist in the 1.2-kb promoter region of the mouse SLPI gene (EMBL Accession no. AF205374). Cotransfection of the 1.2-kb SLPI promoter linked to a luciferase reporter gene and Nrf2 expression plasmid into RAW 264.7 macrophages revealed that the overexpression of Nrf2 activates reporter gene expression in a dose-dependent manner (Fig. 4⇓D). Deletion of the region 950 bp upstream from the SLPI promoter that contains several potential AREs resulted in a marked decrease in Nrf2-mediated luciferase gene expression. These results indicated that the expression of SLPI is under Nrf2 regulation. 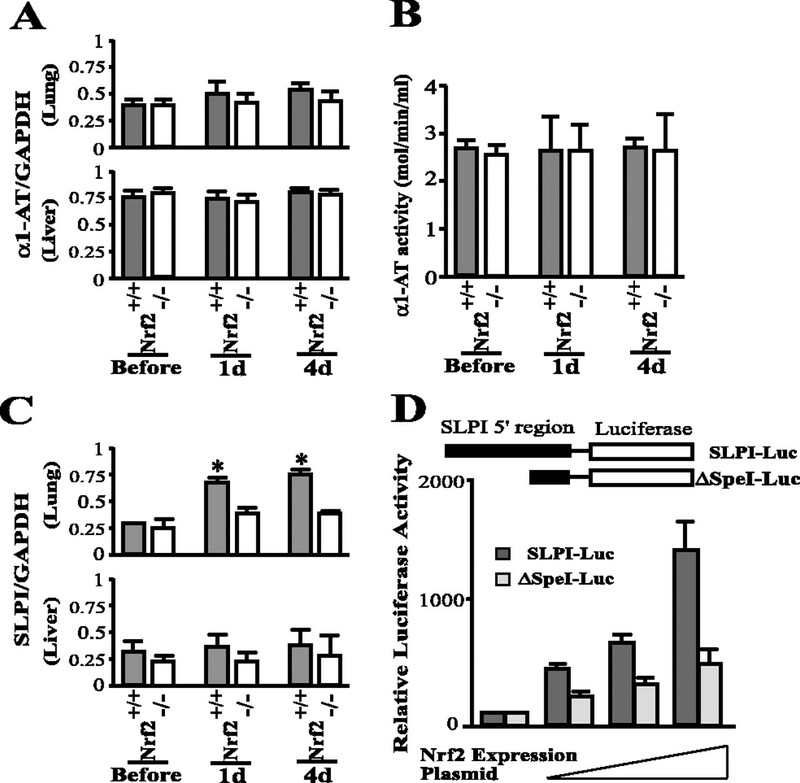 Expression of SLPI is severely affected in Nrf2-KO mice. mRNA expression of α1-antitrypsin (A) and SLPI (C) in the lung (top) and the liver (bottom) of wild-type mice (Nrf2+/+) or Nrf2-KO mice (Nrf2−/−) before (Before) and 1 and 4 days after treatment with PPE. The band density was normalized by GAPDH. B, Serum α1-antitrypsin activity in wild-type mice (Nrf2+/+) or Nrf2-KO mice (Nrf2−/−) before (Before) and 1 and 4 days after treatment with PPE. Significantly different in comparison with corresponding Nrf2-KO mice (∗, p < 0.05). D, A schematic representation (top) of the luciferase reporter constructs is shown. SLPI-luc or the SpeI fragment from SLPI-luc (ΔSpeI-luc) reporter constructs were transfected into RAW 264.7 cells along with an increasing amount of mouse Nrf2 expression plasmid. The luciferase activity of reporter alone was set to 100% and the means of four independent experiments are shown with the SEM. In addition to protease/antiprotease imbalance, oxidative stress is thought to be an important contributor to the pathogenesis of emphysema. Several studies have demonstrated that Nrf2 regulates the gene expression of a wide range of antioxidant enzymes. We therefore examined the induction of GST, NQO1, HO-1, and PrxI in the lungs of both wild-type and Nrf2-KO mice before and after PPE treatment. Small amounts of these mRNA transcripts were constitutively expressed in the lungs of both genotypes before PPE treatment. In wild-type mice, the expressions of PrxI and HO-1 were significantly elevated 1 and 4 days after PPE treatment (Fig. 5⇓, A and B). In Nrf2-KO mice, however, these antioxidant enzymes were not observed to be up-regulated upon PPE treatment (Fig. 5⇓, A and B). 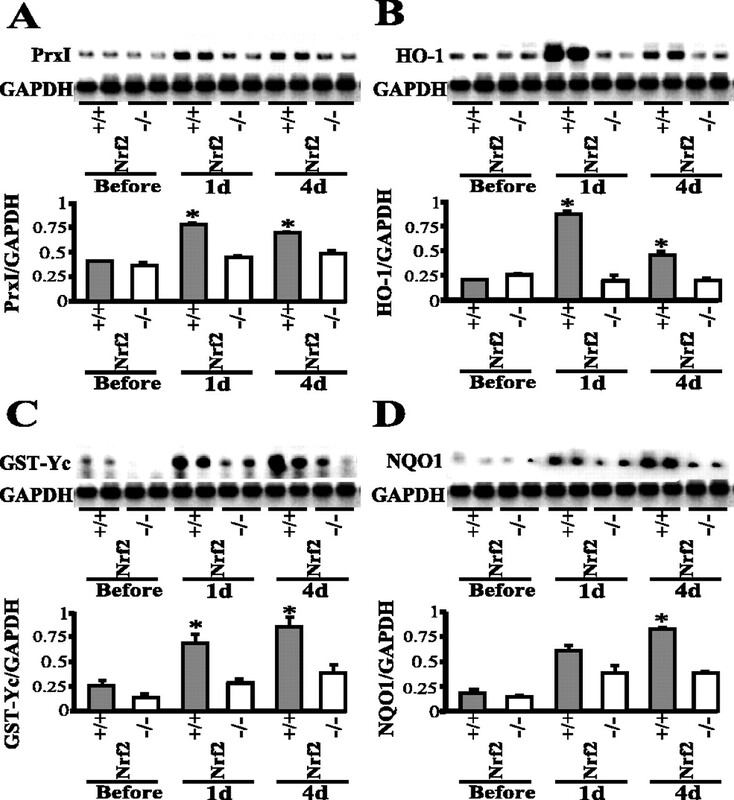 Comparably, the pulmonary expressions of GST-Yc and NQO1 were significantly increased in the lungs of wild-type mice, but not in Nrf2-KO mice, 1 and 4 days after PPE treatment (Fig. 5⇓, C and D). Expression of antioxidant and antiprotease genes is severely affected in Nrf2-KO mice. RNA blot analysis showing the expression of antioxidant defense enzymes in the lungs of wild-type mice (Nrf2+/+) or Nrf2-KO mice (Nrf2−/−) before (Before) and 1 and 4 days after treatment with PPE. A blot representing each expression profile is shown atop each graph. The blots (bottom) were then quantified by densitometric analysis. Significantly different in comparison with corresponding Nrf2-KO mice (∗, p < 0.05). To clarify which cell types express Nrf2-regulated genes, lungs were immunostained with anti-F4/80 (Fig. 6⇓, A and E), anti-PrxI (Fig. 6⇓, B and F), anti-HO-1 (Fig. 6⇓, C and G), and anti-SLPI Abs (Fig. 6⇓, D and H). F4/80-positive macrophages were similarly detected in alveoli of both wild-type and Nrf2-KO mice (Fig. 6⇓, A and E). In wild-type mice, macrophages were strongly stained with PrxI, HO-1, and SLPI 1 day after PPE treatment (Fig. 6⇓, B–D). In contrast, no positive staining by these Abs was observed at any time point in the lungs of Nrf2-KO mice (Fig. 6⇓, F–H and data not shown). To assess further whether Nrf2 is actually expressed in alveolar macrophages, we performed immunoblot analysis using anti-Nrf2 Ab and alveolar macrophage obtained from BAL. The result demonstrated that the expression of Nrf2 and its target gene HO-1 were induced in response to the Nrf2 activator diethylmaleate in wild-type alveolar macrophages, but not in Nrf2-KO alveolar macrophages (Fig. 6⇓I). Expression of antioxidant and antiprotease genes was induced in alveolar macrophages in the lung. 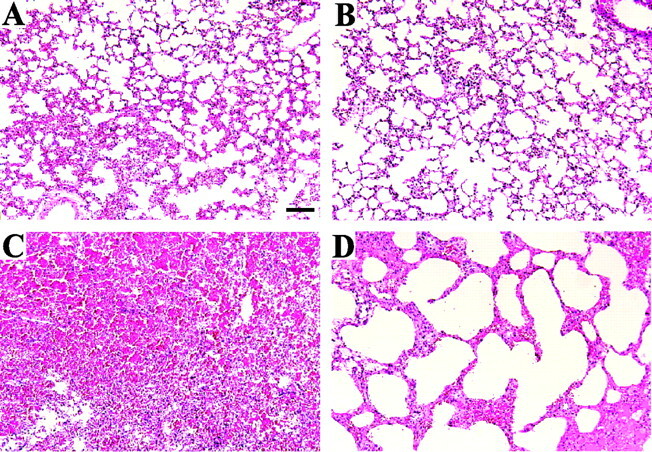 Immunocytochemical localization of macrophage (A and E), PrxI (B and F), HO-1 (C and G), and SLPI (D and H) in the lungs of wild-type (A–D) and Nrf2-KO (E–H) mice 1 day after treatment with PPE. Arrows indicate positive cells. Bar = 100 μm. I, Alveolar macrophages obtained from BAL were either untreated or treated with diethylmaleate for 3 h, and total cell extracts were analyzed by anti-Nrf2 (left) or anti-HO-1 (right) Ab. As a loading control, membranes were also probed with anti-lamin B Ab. The results thus far imply that alveolar macrophages are the main site of Nrf2-mediated gene expression. To further clarify the contribution of macrophages to Nrf2-mediated protection against elastase-induced lung damage, bone marrow cells from wild-type mice were transplanted into Nrf2-KO mice. We first examined the appearance of donor cells in the alveolar spaces of the recipient mice. BAL was performed on days 5, 14, and 35 after BMT and macrophages were isolated using a macrophage marker. The Nrf2 wild-type allele derived from BMT was detectable in these isolated cells by PCR 5 days after BMT and reached a saturated level by 14 days (Fig. 7⇓A). Susceptibility of Nrf2-KO mice to PPE-induced emphysema was rescued by transplantation of wild-type bone marrow cells. A, Expression of Nrf2 wild-type allele in sorted macrophages from Nrf2-KO mice 5, 14, and 35 days after transplantation of wild-type bone marrow cells (Nrf2+/+ BMT) or Nrf2-KO bone marrow cells (Nrf2−/− BMT). B, Male wild-type (Nrf2+/+) or Nrf2-KO (Nrf2−/−) bone marrow cells were transplanted to female recipient mice. Fourteen days after BMT, the ratio of male to female DNA amount in alveolar macrophages was examined by quantitative PCR analysis of the SRY gene. The mean of the ratios obtained from three mice in each group is presented with SEM. C, Lung tissue from Nrf2+/+ BMT mice (left) or Nrf2−/− BMT mice (right) 21 days after treatment with PPE. H&E stain with bar = 100 μm. D, Hemoglobin content (left), albumin concentration (center), and the number of neutrophils (right) in the BAL fluids of wild-type (Nrf2+/+), Nrf2-KO (Nrf2−/−), and Nrf2-KO mice transplanted with wild-type bone marrow (Nrf2+/+ BMT), and Nrf2-KO mice transplanted with Nrf2-KO bone marrow (Nrf2−/− BMT) mice 1 day after treatment with PPE. Data are expressed as the mean ± SEM of four mice from each group. Significantly different from wild-type mice (∗, p < 0.05) or from Nrf2+/+ BMT mice (#, p < 0.05). E, Immunocytochemical localization of HO-1 (left), PrxI (center), and SLPI (right) in the lungs of Nrf2-KO mice transplanted with wild-type bone marrow. Arrows indicate positive cells. We then examined the effects of Nrf2 expression on the survival of macrophages. To this end, we used female wild-type mice as recipients and male Nrf2-KO or wild-type mice as donors, and examined the contribution of male cells to alveolar macrophages of female recipients using SRY gene as a marker (28). We found that significant numbers of donor cells actually flowed in the alveolar space of the lung of recipient mice without stimuli at day 14 after BMT. The contribution of male cells to alveolar macrophages of female recipients was 8.1% with wild-type mouse-derived bone marrow cells and 12.8% with Nrf2-KO mouse-derived bone marrow cells, showing that there was no significant difference in the influx of Nrf2-null donor cells from that of wild-type donor cells (Fig. 7⇑B). These results demonstrate that Nrf2 does not influence the influx of macrophages from bone marrow cells without stimuli. Therefore, using this model system, we administered PPE 14 days after BMT. Destruction of the alveolar architecture 21 days after PPE treatment was markedly less severe in mice transplanted with wild-type mouse bone marrow (Fig. 7⇑C, left) than in mice transplanted with Nrf2-KO bone marrow (Fig. 7⇑C, right). The degree of initial lung inflammation was also attenuated in mice transplanted with wild-type bone marrow, compared with mice transplanted with Nrf2-KO bone marrow. The BAL hemoglobin level (Fig. 7⇑D, left), albumin concentration (Fig. 7⇑D, center), and neutrophil number (Fig. 7⇑D, right) were significantly decreased 1 day after PPE treatment in mice transplanted with wild-type bone marrow, compared with mice transplanted with Nrf2-KO bone marrow. Correspondingly, Nrf2-regulated host defense proteins such as HO-1, PrxI, and SLPI were expressed in macrophages 1 day after PPE treatment in mice transplanted with wild-type mouse bone marrow (Fig. 7⇑E). These results demonstrate that the Nrf2-mediated defense system works mainly in macrophages in the protection against PPE-induced emphysema. This study unveiled for the first time that Nrf2-KO mice are highly susceptible to PPE-induced emphysema. We found that lung inflammation in both the initial and subsequent stages of PPE-provoked emphysema was markedly exacerbated in Nrf2-KO mice. The expressions of several antioxidant enzyme genes, such as NQO1, GST-Yc, HO-1, and PrxI and the antiprotease gene SLPI were markedly induced by PPE treatment in wild-type lung. However, the inducible expression of these genes was largely abolished in the lungs of Nrf2-KO mice. Immunohistochemical analysis revealed that the inducible expression of HO-1, PrxI, and SLPI was observed in alveolar macrophages in wild-type lung. In Nrf2-KO mice transplanted with wild-type mouse bone marrow, both initial lung inflammation and subsequent emphysema were significantly ameliorated with the appearance of Nrf2-positive macrophages. Thus, Nrf2 is a key regulator in the macrophage-mediated defense system against lung injury. Elastase, especially PPE, has been used to provoke emphysema in animal models. Kinetic studies and analysis of mutant mice lacking inflammatory mediators have demonstrated that emphysema induced by a low dose of PPE, as is the case for our study, is not due to the immediate proteolytic activity of PPE, but is mostly due to the subsequent inflammation caused by PPE (29, 30, 31, 32). Thus, the susceptibility of Nrf2-KO mice to PPE-induced emphysema might be due to a decreased antiprotease activity against PPE itself or a decreased anti-inflammatory activity against PPE-induced inflammation, or both. The latter possibility is in close agreement with the observation that Nrf2-KO mice are highly sensitive to pulmonary inflammation caused by environmental toxins such as butylated hydroxytoluene (8) and hyperoxia (9). In addition to parenchymal inflammation and oxidative stress, an imbalance between proteases and antiproteases in the lung is important in the pathogenesis of emphysema. Neutrophil elastase has been implicated as the critical protease responsible for lung destruction. In the present study, neutrophil elastase activity in BAL fluids was significantly higher in Nrf2-KO mice than in wild-type mice after PPE treatment, suggesting that an imbalance between protease and antiprotease levels is conspicuous in Nrf2-KO mice. This elevated neutrophil elastase activity in Nrf2-KO mice might be due to increased neutrophil infiltration or due to a decrease in antiprotease gene expression. α1-Antitrypsin is the major antiprotease that inhibits a number of serine proteases such as neutrophil elastase. Individuals with a hereditary deficiency in α1-antitrypsin are known to develop progressive emphysema at a relatively early age (6, 7). However, both the expression of α1-antitrypsin in the liver and its activity in serum did not differ between wild-type and Nrf2-KO mice. Interestingly, whereas the SLPI gene was highly inducible in the lungs of wild-type mice after PPE treatment, induction of the SLPI gene did not occur in the lungs of Nrf2-KO mice. SLPI is an 11.7-kDa mucosal secretory protein identified as a serine protease inhibitor and involved in protection against neutrophil elastase damage (33). Unlike α1-antitrypsin, SLPI is produced at the site of inflammation by several inflammatory stimuli including LPS (34), neutrophil elastase (35), and proinflammatory cytokines (36). SLPI, therefore, may participate in the first line of defense against protease damage at the inflamed site. In addition to the antiprotease activity, murine SLPI has been shown to attenuate inflammatory cytokine production in macrophages (37, 38). Moreover, human SLPI has been demonstrated to prevent activation of the inflammatory transcription factor NF-κB by inhibition of IκB degradation (39). 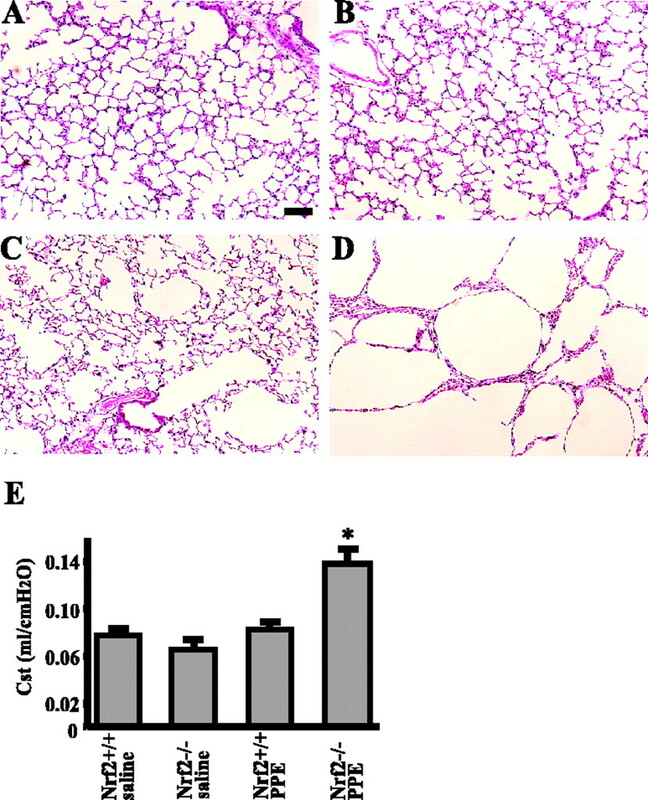 Thus, reduced production of SLPI, which acts as both antiprotease and anti-inflammatory factor at the site of lung inflammation, may be an additional important factor that explains the susceptibility of Nrf2-KO mice to emphysema. To our knowledge, this is the first report demonstrating that the antiprotease gene is under Nrf2 regulation. In the present study, induction of Nrf2 target genes, such as HO-1, PrxI, and SLPI was observed in alveolar macrophages in wild-type mice after PPE treatment. This observation is consistent with a series of studies in which Nrf2 target genes, including HO-1 and PrxI, were induced abundantly in macrophages (16, 17). It has also been demonstrated that macrophages, as well as epithelial cells, are the major sources of SLPI (34, 38). Moreover, we demonstrated that the promoter activity of SLPI up-regulated by Nrf2 in the macrophage cell line RAW 264.7 (Fig. 4⇑D). Because macrophages are the major source of reactive oxygen species and proteases, as well as inflammatory cytokines, it is reasonable to hypothesize that the aberrant gene expression in Nrf2-KO macrophages may cause an overwhelming inflammatory response and thus evoke lung injury. In Nrf2-KO mice transplanted with wild-type mouse bone marrow, both initial lung inflammation and subsequent emphysema were significantly attenuated with the appearance of Nrf2-positive macrophages. A defense system based on macrophages, therefore, is thought to be important in protection against lung injury. Chronic obstructive pulmonary disease is a major cause of chronic morbidity and mortality worldwide, so an effective treatment is in great want. Recently, the anti-inflammatory activities of the Nrf2/ARE system have been widely recognized (40). Thus, activation of Nrf2 in alveolar macrophages might be a useful therapeutic approach for protection against the development of lung inflammation and emphysema. We thank Dr. Tania O’Connor for critical reading of the manuscript and Mark J. Kiel for help and advice. ↵1 This work was supported in part by grants from the Japan Science and Technology Agency-ERATO. ↵3 Abbreviations used in this paper: ARE, antioxidant response element; PPE, porcine pancreatic elastase; BAL, bronchoalveolar lavage; KO, knockout; SLPI, secretory leukoprotease inhibitor; BMT, bone marrow transplantation. Murray, C. J., A. D. Lopez. 1997. Alternative projections of mortality and disability by cause 1990–2020: Global Burden of Disease Study. Lancet 349:1498.-1504. Barnes, P. J.. 2000. Chronic obstructive pulmonary disease. N. Engl. J. Med. 343:269.-280. Repine, J. E., A. Bast, I. Lankhorst. 1997. Oxidative stress in chronic obstructive pulmonary disease. Am. J. Respir. Crit. Care Med. 156:341.-357. Barnes, P. J.. 2003. New concepts in chronic obstructive pulmonary disease. Annu. Rev. Med. 54:113.-129. Siafakas, N. M., E. G. Tzortzaki. 2002. Few smokers develop COPD: why?. Respir. Med. 96:615.-624. Hubbard, R. C., R. G. Crystal. 1991. Antiproteases. R. G. Crystal, and J. B. West, and P. J. Barnes, eds. The Lung: Scientific Foundations 1775.-1787. Raven Press, New York. McElvaney, N. G., R. G. Crystal. 1997. Inherited susceptibility of the lung to proteolytic injury. R. G. Crystal, and J. B. West, and E. R. Weibel, and P. J. Barnes, eds. The Lung: Scientific Foundations 2537.-2553. Lippincott-Raven, Philadelphia. Itoh, K., T. Chiba, S. Takahashi, T. Ishii, K. Igarashi, Y. Katoh, T. Oyake, N. Hayashi, K. Satoh, I. Hatayama, et al 1997. An Nrf2/small Maf heterodimer mediates the induction of phase II detoxifying enzyme genes through antioxidant response elements. Biochem. Biophys. Res. Commun. 236:313.-322. Ishii, T., K. Itoh, S. Takahashi, H. Sato, T. Yanagawa, Y. Katoh, S. Bannai, M. Yamamoto. 2000. Transcription factor Nrf2 coordinately regulates a group of oxidative stress-inducible genes in macrophages. J. Biol. Chem. 275:16023.-16029. Itoh, K., K. I. Tong, M. Yamamoto. 2004. Molecular mechanism activating Nrf2-Keap1 pathway in regulation of adaptive response to electrophiles. Free Radical Biol. Med. 36:1208.-1213. Kobayashi, A., T. Ohta, M. Yamamoto. 2004. Unique function of the Nrf2-Keap1 pathway in the inducible expression of antioxidant and detoxifying enzymes. Methods Enzymol. 378:273.-286. Itoh, K., N. Wakabayashi, Y. Katoh, T. Ishii, T. O’Connor, M. Yamamoto. 2003. Keap1 regulates both cytoplasmic-nuclear shuttling and degradation of Nrf2 in response to electrophiles. Genes Cells 8:379.-391. McMahon, M., K. Itoh, M. Yamamoto, J. D. Hayes. 2003. Keap1-dependent proteasomal degradation of transcription factor Nrf2 contributes to the negative regulation of antioxidant response element-driven gene expression. J. Biol. Chem. 278:21592.-21600. Yoh, K., K. Itoh, A. Enomoto, A. Hirayama, N. Yamaguchi, M. Kobayashi, N. Morito, A. Koyama, M. Yamamoto, S. Takahashi. 2001. Nrf2-deficient female mice develop lupus-like autoimmune nephritis. Kidney Int. 60:1343.-1353. Chan, K., X. D. Han, Y. W. Kan. 2001. An important function of Nrf2 in combating oxidative stress: detoxification of acetaminophen. Proc. Natl. Acad. Sci. USA 98:4611.-4616. Enomoto, A., K. Itoh, E. Nagayoshi, J. Haruta, T. Kimura, T. O’Connor, T. Harada, M. Yamamoto. 2001. High sensitivity of Nrf2 knockout mice to acetaminophen hepatotoxicity associated with decreased expression of ARE-regulated drug metabolizing enzymes and antioxidant genes. Toxicol. Sci. 59:169.-177. Aoki, Y., H. Sato, N. Nishimura, S. Takahashi, K. Itoh, M. Yamamoto. 2001. Accelerated DNA adduct formation in the lung of the Nrf2 knockout mouse exposed to diesel exhaust. Toxicol. Appl. Pharmacol. 173:154.-160. Ramos-Gomez, M., M. K. Kwak, P. M. Dolan, K. Itoh, M. Yamamoto, P. Talalay, T. W. Kensler. 2001. Sensitivity to carcinogenesis is increased and chemoprotective efficacy of enzyme inducers is lost in nrf2 transcription factor-deficient mice. Proc. Natl. Acad. Sci. USA 98:3410.-3415. Chan, K., Y. W. Kan. 1999. Nrf2 is essential for protection against acute pulmonary injury in mice. Proc. Natl. Acad. Sci. USA 96:12731.-12736. Cho, H. Y., A. E. Jedlicka, S.P. Reddy, T. W. Kensler, M. Yamamoto, L. Y. Zhang, S. R. Kleeberger. 2002. Role of NRF2 in protection against hyperoxic lung injury in mice. Am. J. Respir. Cell Mol. Biol. 26:175.-182. Itoh, K., M. Mochizuki, Y. Ishii, T. Shibata, Y. Kawamoto, T. Ishii, V. Kelly, K. Sekizawa, K. Uchida, M. Yamamoto. 2004. Transcription factor Nrf2 regulates inflammation by mediating the effect of 15-deoxy-Δ12,14-prostaglandin-J2. Mol. Cell. Biol. 24:36.-45. Mochizuki, M., Y. Ishii, K. Itoh, T. Iizuka, Y. Morishima, T. Kimura, T. Kiwamoto, Y. Matsuno, A. E. Hegab, A. Nomura, et al 2005. Role of 15-deoxy-Δ12,14-prostaglandin-J2 and Nrf2 pathways in protection against acute lung injury. Am. J. Respir. Crit. Care Med. 171:1260.-1266. Hayes, J. A., A. Korthy, G. L. Snider. 1975. The pathology of elastase-induced panacinar emphysema in hamsters. J. Pathol. 117:1.-14. Kaplan, P. D., C. Kuhn, J. A. Pierce. 1973. The induction of emphysema with elastase. I. The evolution of the lesion and the influence of serum. J. Lab. Clin. Med. 82:349.-356. Saetta, M., R. J. Shiner, G. E. Angus, W. D. Kim, N. S. Wang, M. King, H. Ghezzo, M. G. Cosio. 1985. Destructive index: a measurement of lung parenchymal destruction in smokers. Am. Rev. Respir. Dis. 131:764.-769. Sakamaki, F., A. Ishizaka, T. Urano, K. Sayama, H. Nakamura, T. Terashima, Y. Waki, S. Tasaka, N. Hasegawa, K. Sato, et al 1996. Effect of a specific neutrophil elastase inhibitor, ONO-5046, on endotoxin-induced acute lung injury. Am. J. Respir. Crit. Care Med. 153:391.-397. Dietz, A. A., H. M. Rubinstein, L. Hodges. 1976. Use of α-N-benzoyl-l-arginine-p-nitroanilide as trypsin substrate in estimation of α1-antitrypsin. Clin. Chem. 22:1754.-1755. Kiel, M. J., Ö. H. Yilmaz, T. Iwashita, O. H. Yilmaz, C. Terhorst, S. J. Morrison. 2005. SLAM family receptors distinguish hematopoietic stem and progenitor cells and reveal endothelial niches for stem cells. Cell 121:1109.-1121. Lucey, E. C., P. J. Stone, T. G. Christensen, R. Breuer, G. L. Snider. 1988. An 18-month study of the effects on hamster lungs of intratracheally administered human neutrophil elastase. Exp. Lung Res. 14:671.-686. Stone, P. J., E. C. Lucey, J. D. Calore, M. P. McMahon, G. L. Snider, C. Franzblau. 1988. Defenses of the hamster lung against human neutrophil and porcine pancreatic elastase. Respiration 54:1.-15. Lucey, E. C., J. Keane, P. P. Kuang, G. L. Snider, R. H. Goldstein. 2002. 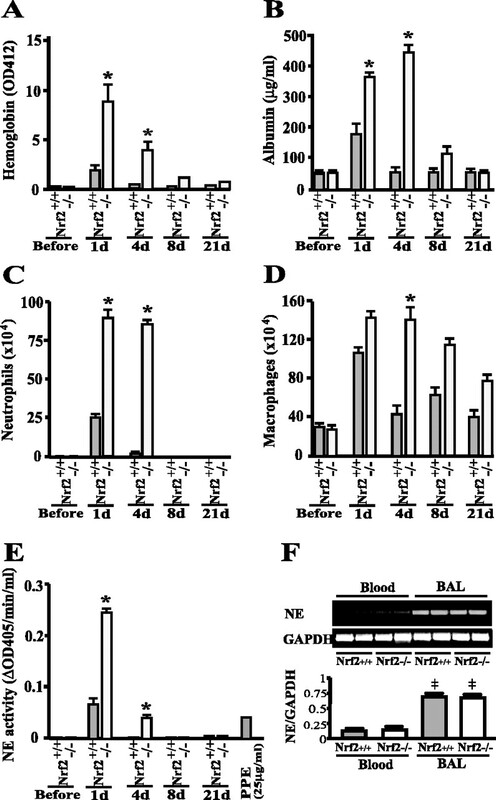 Severity of elastase-induced emphysema is decreased in tumor necrosis factor-α and interleukin-1β receptor-deficient mice. Lab. Invest. 82:79.-85. Snider, G. L., C. B. Sherter. 1977. A one-year study of the evolution of elastase-induced emphysema in hamsters. J. Appl. Physiol. 43:721.-729. McElvaney, N. G., R. G. Crystal. 1997. Inherited susceptibility of the lung to proteolytic injury. R. G. Crystal, and J. B. West, and E. R. Weibel, and P. J. Barnes, eds. The Lung: Scientific Foundations 2219.-2235. Lippincott-Raven, Philadelphia. Jin, F. Y., C. Nathan, D. Radzioch, A. Ding. 1997. Secretory leukocyte protease inhibitor: a macrophage product induced by and antagonistic to bacterial lipopolysaccharide. Cell 88:417.-426. Abbinante-Nissen, J. M., L. G. Simpson, G. D. Leikauf. 1993. Neutrophil elastase increases secretory leukocyte protease inhibitor transcript levels in airway epithelial cells. Am. J. Physiol. 265:L286.-L292. Sallenave, J. M., J. Shulmann, J. Crossley, M. Jordana, J. Gauldie.. 1994. Regulation of secretory leukocyte proteinase inhibitor (SLPI) and elastase-specific inhibitor (ESI/elafin) in human airway epithelial cells by cytokines and neutrophilic enzymes. Am. J. Respir. Cell Mol. Biol. 11:733.-741. Betsuyasu, T., K. Takeyabu, M. Tanino, M. Nishimura. 2002. Role of secretory leukocyte protease inhibitor in the development of subclinical emphysema. Eur. Respir. J. 19:1051.-1057. Odaka, C., T. Mizuochi, J. Yang, A. Ding. 2003. Murine macrophages produce secretory leukocyte protease inhibitor during clearance of apoptotic cells: implications for resolution of the inflammatory response. J. Immunol. 171:1507.-1514. Lentsch, A. B., J. A. Jordan, B. J. Czermak, K. M. Diehl, E. M. Younkin, V. Sarma, P. A. Ward. 1999. Inhibition of NF-κB activation and augmentation of IκBβ by secretory leukocyte protease inhibitor during lung inflammation. Am. J. Pathol. 154:239.-247. Chen, X. L., C. Kunsch. 2004. Induction of cytoprotective genes through nrf2/antioxidant response element pathway: a new therapeutic approach for the treatment of inflammatory diseases. Curr. Pharm. Des. 10:879.-891.